There is an abundance of the best air mattresses in the market today. Instead of having a challenging time finding the perfect one for you, it is actually more difficult to narrow the choices down to the best of the best because there are just too many good ones. So many individuals and households own an air mattress or even a few because of how useful it can be. Welcome house guests with a comfortable night’s sleep with your air mattress. Wake up to the lovely morning sun without backaches and bugs creeping up on you during a camping trip with your air mattress. With your air mattress, you need not worry about expensive hotel bills during a road trip because you can still comfortably sleep through the night in your own car. 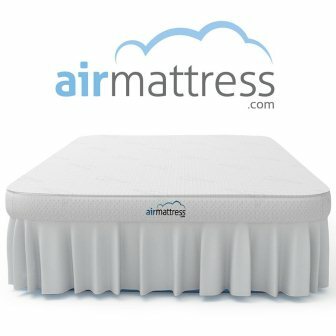 If you are looking for the best air mattresses and have found yourself on a dead end because of too many confusing reviews, lengthy lists of supposedly great air mattresses, read on and know more about what you have to look for, what to expect from an air mattress and proper care and maintenance once you already own one. As a bonus, the top 10 best air mattresses you can choose from are narrowed down too so you can have an easier time choosing the perfect one for you. When Do You Need an Air Mattress? Is an Air Mattress Ideal for Permanent Use? A mattress wouldn’t be called an air mattress if it was not filled with air. Air mattresses are most often than not deflated when purchased or when in storage. In order to set it up, one has to unfold or unroll it, lay it on a flat surface, preferably where you plan to use it, then inflate. Inflating an air mattress can be done by using a separate air pump, which can be operated manually or electronically. Note that if you use a manual air pump, you will have to exert a lot of effort and spend so much time inflating the air mattress, especially if you have a large, raised one. Rest assured, it can be done. It is good to know though that you have a choice. There are automatic air pumps that are powered by battery or electricity. Using an electronic air pump is simpler because you just have to plug the pump into an electric outlet or load it with batteries, then wait until the air mattress has reached your desired firmness. There are many air mattresses that come with a built-in air pump, several of those included in the list below, so you won’t have to worry about buying one separately. Remember, when your air mattress is rock solid, then you must have inflated it too much. You need to release a few seconds of air for extra space for stretching. If you put your entire body weight on an air mattress that has excessive air pressure, it may burst or get damaged. Just the right amount of firmness and air removes creases and bulges on the air mattress. Its body must be fully stretched out. An automatic air pump in an air mattress usually detects the amount of air pressure in the bed. It automatically stops inflating once the desired firmness of the air mattress is reached. Once fully inflated, your air mattress is ready for use. Some air mattresses require different ways of initial setup compared to others. It is best to read the manual or instruction guide that comes with it thoroughly to ensure you’re setting it up the proper way. For instance, there are manufacturers that would recommend for you to inflate the air mattress once, deflate it then inflate once more before using it for the first time. This allows the material of the mattress to stretch fully. When you are ready to store your air mattress after using, it is best to deflate it rather than leaving it as is. Most air mattresses with built in air pumps come with a deflating feature. If not, you can manually deflate by opening the valve cover and slightly putting your weight into the mattress to help make the process faster. If you need to save even more time, you can try using a standard vacuum cleaner. Again, the deflating and storage process must also be included in the manual for your air mattress. When if doubt, call the customer support number of the manufacturer of your air mattress. An air mattress usually comes with a carry bag. After completely deflating the air mattress, fold or roll it then place it inside its carry bag or storage bag before keeping it in a clean and dry place. Camping — While others opt for a regular sleeping bag when camping, others choose the more comfortable option by bringing an air mattress along. Truth be told, an air mattress when deflated is more portable and much smaller than most folded sleeping bags. Though setting it up can take a little more time than just laying down a sleeping bag flat on the floor, the time and effort is well worth it because you’re guaranteed to sleep soundly through the night with an air mattress on your back. For Visiting Family and Friends — If you have experienced sleeping over someone else’s house for the night and you had to settle for the couch, you must know how uncomfortable it can get, especially if the couch is pretty small. You wouldn’t want the same discomfort experienced by your own house guests. Buying bed frames with traditional mattresses will cost you a lot of money and will take up much space when not in use so that isn’t a very practical option. However, you can bring out your air mattress, inflate it and be the most hospitable host by keeping your guests comfortable through the night. On a Road Trip — Whether you’re taking an RV, an SUV, van or even you’re trusty old sedan, there’s an air mattress that fits right in. When on a road trip, especially one that lets you drive around the country for days or weeks at a time, you can’t always be sure that you’ll be in a place where there’s a nice hotel for you to spend the night. Especially if you’re on a tight budget, wouldn’t it be great if you can just sleep in the car? You don’t have to uncomfortably find the almost impossible best position in the car anymore because with an air mattress, you’ll definitely be getting those much-needed zzz’s minus backaches in the morning. Some people will tell you that it’s okay to use an air mattress as your daily bed. There are even manufacturers that would claim that their air mattress is durable enough to last through years of daily use. Truth be told, air mattresses are not meant for use for an extended period of time. Trusted manufacturers will admit to you this fact and will most likely recommend someone using an air mattress daily for just one or two months. Perhaps as a temporary daily bed that you will be using for a short timeframe, an air mattress will hold up just right. 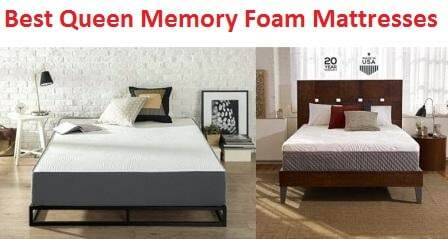 However, if you are looking for a bed that you can use for many years, it is still more practical to choose a mattress made with memory foam, regular foam with springs or other forms of traditional mattresses. Air mattresses are generally more affordable than traditional mattresses, which makes it more tempting to just get an air mattress for your personal daily use at home. However, if you want to be truly practical, you must realize that air mattresses, no matter the brand, are not made for permanent use. If you’re looking for a mattress that you can use every once in a while, say once in a week or a few times every month, then an air mattress will be a perfect choice for you. It is important to mention, however, that there are still many individuals who use air mattresses as their permanent bed and most of them can attest to the fact that they are able to use this type of bed for years before it is due for replacement. It truly is a matter of preference. If you don’t mind having to buy a new bed every year or so, then an air mattress is okay for permanent use. When shopping for an air mattress, you’ll be in awe with the number of products that are available in the market. In fact, there are way too many choices and with advertisements all so tempting and irresistible, it seems that each one seems like the best choice. To help you narrow down these numerous air mattresses to the truly best ones and eventually pick the perfect product for you, here are some key features and characteristics to take into consideration. As earlier mentioned, setting up an air mattress takes a bit of time; and the amount time used to set it up depends on the mattress you have. Unlike traditional mattresses that you can leave inside a room for months and instantly use when you need it, air mattresses still need to be removed from storage and/or inflated and/or topped with air for it to be usable. Ideally, an air mattress should be easy to unroll or unfold. It may seem that this process is supposed to be simple in the first place but in some cases, even the task of just having to prepare the air mattress for inflation can be quite tiring. Once the mattress is already laid flat on a surface, it should also be simple to inflate. An air pump may be built-in with the air mattress or you may have to use a separate air pump. Either way, the process should be simple and not too tedious. A built-in air pump is generally more convenient than having to get a separate air pump. Not only will this be less of a hassle because you simply need to plug in the mattress to an outlet, but this also lessens the storage space you need. It is important to mention though that a built-in air pump, which is powered electronically, and does not come with a rechargeable feature can be an issue if you intend to take your air mattress to camping or road trips that won’t give you easy access to a power outlet. Furthermore, when it comes to repair needs, when a built-in air pump of an air mattress is beyond repair, then you will have to replace the entire air mattress. If you have a separate air pump that’s faulty, you can easily replace the pump and continue using the same air mattress. PVC and vinyl are two of the most common materials used for air mattresses. Another material commonly used in building air mattresses is called the thermoplastic urethane or TPU. This is an elastic, puncture-resistant and very durable type of material, which many claim as stronger and better than PVC, but this comes with a price. 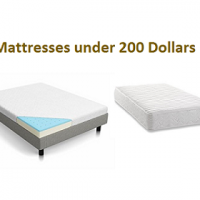 Air mattresses made of TPU material are generally more expensive than PVC air mattresses; however, it definitely is worth every penny you spend for it, especially since you can expect it to hold up for years. It is good to note though that PVC is still a great material of choice. It is waterproof, easy to clean, fire-retardant in most cases (check the detailed specifications of an air mattress first regarding this), and again, it is quite affordable. Air mattresses may be made with just bare PVC, vinyl or TPU material. However, most manufacturers reinforce their product with fabric such as suede or velour to make it more attractive-looking and comfortable to sleep in. If you aren’t going to be comfortable in your air mattress, then what difference does it make from sleeping on the floor or just using a sleeping bag? Of course, comfort should be one of the most important factors to consider when choosing the best air mattress. Find the right amount of firmness that will keep you comfortable and will let you sleep soundly through the night. The fabric cover or reinforcement of your air mattress also adds to the comfort although you can and you probably should place a bed sheet first before use. If you share your bed with someone else, you will be glad to know that an air mattress can provide an even level surface for much comfort. Most air mattresses in the market today use the coil technology wherein coils are constructed inside the mattress for support and stability. Since air mattresses are usually placed directly on the floor, there’s a tendency for it to move overnight especially if you’re one who tosses and turns while sleeping. There are air mattresses that have grip features on the bottom to prevent the mattress from moving and keeping it in its place. Another feature that adds comfort to an air mattress is the fabric that tops it. Suede and flocked tops are some of the most common ones you will find. Last but definitely not the least, the firmness of an air mattress will keep you comfortable for sure. If you prefer a very firm mattress or one that’s super soft, you can adjust this according to how much air you inflate into the bed. There are some air mattresses that offer automatic pump features that can adjust the bed’s firmness. If the air mattress you chose doesn’t have an automatic air pump, you can adjust the firmness of the bed on your own by topping the mattress with air or releasing a bit of air. Depending on your intended use, size truly matters when choosing the best air mattress. If you will be using one for your car or for camping, and if only one person will be using the air mattress at a time, a single or twin-sized air mattress will do. The most common sizes you will find when shopping for an air mattress include the basic ones you will also find in traditional mattresses — single, twin, double, queen and king. This is actually good because you also won’t have a difficult time looking for sheets that will perfectly fit your air mattress. Of course, there are some air mattresses that are available only in limited sizes; in some cases, one size only. Another consideration you must take is the height of the air mattress. Unlike traditional mattresses that are most often than not placed on top of a bed frame, an air mattress is used temporarily so it will most likely be just on any flat surface. Having to bend over, sit then lay down on an air mattress that is very low could be difficult especially from those who suffer from backaches. Some air mattresses have a raised height of only 8 inches or even less. There are some air mattresses that are raised at over 20 inches. The right height of your air mattress still depends on your desired use. For instance, if you intend to use this for camping and you have a small tent, or if you need to spend the night in your car, then a raised air mattress most probably won’t work. However, if the air mattress is for your own or your guest’s use in your own home, the thicker the air mattress is, the better. Thickness doesn’t only add comfort when you’re lying down on the mattress, it wouldn’t be too hard to sit down and settle into your mattress even without a bed frame. Finally, the price tag of the air mattress is a very important consideration too. If you are one of those who choose to use an air mattress as a permanent bed, then paying for a more expensive one with a guarantee of exceptional durability is definitely fine. However, if you will only use the air mattress occasionally and it will be left in storage most of the time, a more affordable one might just be the air mattress you need. As always, this is a matter of preference and you must never assume that the price is equal to quality. There are air mattresses that are fairly cheap but the quality is far from cheap. It is best to look for one that will give you most value for your money. Place your air mattress in its proper storage. Air mattresses usually come with a bag where you can keep it when not in use. Don’t throw this away or take this for granted. Even if you have an extra closet or drawer where you can keep the air mattress, when not protected by its proper storage container, it may become damaged through time. Pests can feed on it and it may get dirty. So you won’t have to worry about these things and so your air mattress is ready for immediate use after inflation even when stored for a long period of time, keep it in its proper container. Use a bed sheet. While no one’s stopping you from using your air mattress directly without any sheets, it is still better, not to mention more hygienic, to use a bed sheet. It can be tempting to just use the air mattress as is especially if the fabric that’s wrapped around it is soft and clean, but if you want your air mattress to stay clean and less prone to damage, then best to use a bed sheet at all times. Top the air mattress with air as needed. If you have used the air mattress for one or two nights and need to use it for another one, top it with an extra 5 to 15 seconds of air. This means that you need to add a little bit more air into the air mattress by means of inflation. You need to do this because the air mattress releases or loses some air when weight is applied to it such as when you have slept on it overnight. To maintain its firmness and its comfort as well, top it with air. Make sure you place your air mattress in a flat and clean surface. When camping, it is best to place a sheet on the floor instead of placing the air mattress directly on it. Whether you’re using it indoors or outdoors, check whether the surface is very clean and free from any objects that may cause damage to your mattress. Don’t bring any sharp objects to bed. While most air mattresses promise puncture-resistance, taking an extra precaution wouldn’t be too hard, right? Check whether there are pins on your clothes or if you have an uncovered pen in your pocket. After all, prevention is better than repairs! Because there are so many impressive air mattresses in the market today, narrowing down the best to just the top 10 was quite challenging. However, with intensive research, comparison of reviews from critics and feedback from actual owners, as well as the important features and characteristics mentioned above, the much deserving air mattresses all claimed a spot on this list. Perhaps the most in demand and best-selling air mattress in the market today, the SoundAsleep Dream Series Air Mattress leaves none of your demands behind. 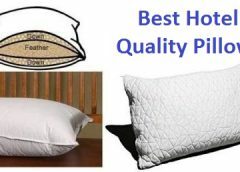 It is packed with all the features you should be expecting from a perfect air mattress and it is so easy to use. No wonder there are thousands of very satisfied owners of this air mattress. If the attractive price tag isn’t enough, you’ll surely appreciate how this air mattress with a built-in air pump inflates in four minutes or less. This is one of the best mattresses for camping. The SoundAsleep Dream Series Air Mattress comes with a bag that perfectly fits the entire mattress when folded or rolled up. You simply have to unroll the mattress, place it on a flat surface, remove the power cord from its pocket then plug into an outlet. As mentioned, its built-in air pump can inflate the air mattress in four minutes or less. If that’s not simple enough for you, it’s good to know that the air pump doesn’t only inflate but can deflate the mattress as well. There’s no more need to struggle to get all the air out prior to storage. By the way, the built-in EZ pump of this air mattress is said to be 20% more silent than other built-in air pumps of air mattresses. As easy as that, your SoundAsleep Dream Series Air Mattress is ready for use. This air mattress wouldn’t be at the best-selling level as it is and wouldn’t get thousands of amazing reviews from professional critics and regular consumers if it weren’t for its impressive durability. 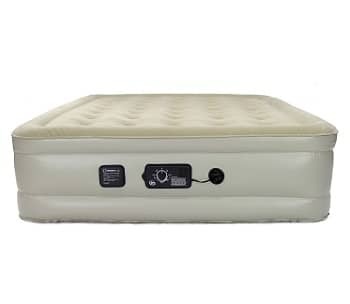 Made with an eco-friendly PVC multilayer 15-gauge puncture-resistant material, the SoundAsleep Dream Series Air Mattress is as durable as you need your air mattress to be. The material used to build this mattress helps maintain the bed’s firmness and shape, minimize sagging and air loss for a comfortable night’s sleep. Furthermore, the flocked top is not only pretty and soft, it is waterproof too. 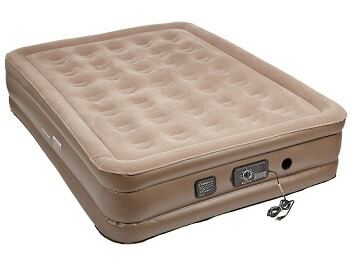 The SoundAsleep Dream Series Air Mattress is so durable, it allows up to 500 lbs. of weight without any problem. Who would have thought that an air mattress could be this comfortable and inviting? The SoundAsleep Dream Series Air Mattress can give you a nap that’s as good as one you’re getting from a traditional mattress. First of all, you have to remember how the material used to build this mattress minimizes sagging and air loss, which means you won’t have to wake up in the middle of the night with a flat bed that needs additional inflation. The SoundAsleep Dream Series Air Mattress also features a “Sure-Grip” bottom so that you won’t have to wake up on the other side of the room because your bed stays in place. The ComfortCoil Technology is what makes this bed very comfortable though. The queen-sized SoundAsleep Dream Series Air Mattress comes with 40 individual air coils so that the mattress remains flat, which is highly important especially if you are sharing the bed with someone else. The SoundAsleep Dream Series Air Mattress comes in queen and twin sizes. The queen-sized air mattress’ height is at 19 inches, which adds support and makes it easier for you to get on the bed, even without a bed frame. The twin-sized bed is at a fair 18-inch height as well. The Insta-Bed Raised Air Mattress comes at a close second on this top 10 list of best air mattresses. Also fairly priced with a few designs and sizes to choose from, this air mattress is simply one of the best and truly difficult to resist. Choose from a full-sized air mattress, a queen-sized with headboard, a queen pillow top bed, a white queen and twin mattress. You can practically have one Insta-Bed Raised Air Mattress in each room of your home! What sets the Insta-Bed Raised Air Mattress apart from other air mattresses is that it comes with two built-in air pumps in just one bed. Just like the previous SoundAsleep mattress covered on this list, the Insta-Bed Raised Air Mattress’ primary pump can inflate the air mattress in four minutes or less. It has a deflating function as well. The primary pump also has an auto-shutoff feature so you can leave it inflating while you’re doing other things. The Never Flat pump is the secondary air pump that you will surely love. You never have to top this air mattress with air because it automatically does so by itself through detection of how firm you desire your mattress to be. You can choose from plush, medium and firm. Just set it to your desired firmness and the Never Flat pump will adjust the firmness silently each time needed. Made with very durable puncture-resistant PVC material, the Insta-Bed Raised Air Mattress will definitely last for a very long time. Of course, proper maintenance and care must be followed. Because of the Never Flat technology that automatically adjusts the firmness of your air mattress, you won’t be inflating it too much or too little. This keeps the mattress sturdy and less prone to damage just because of improper inflation. The Insta-Bed Raised Air Mattress already comes with a convenient carry bag. Again, the Never Flat technology of the Insta-Bed Raised Air Mattress makes this bed as comfortable as you need it to be. No waking up in the middle of the night with a flat air bed because the air pump does its job on its own. Just leave it and it will do its work. Furthermore, the Insta-Bed Raised Air Mattress features an advanced support construction with a circular coil system for added comfort. 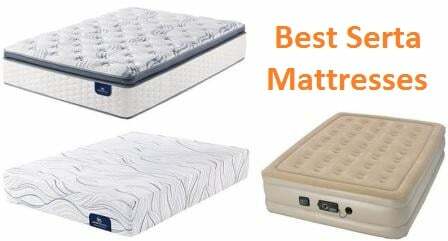 In addition, the mattress will surely stay in place all the time with its Sure Grip bottom. When inflated, the queen-sized Insta-Bed Raised Air Mattress measures 80 x 60 x 18 inches. The twin-sized Insta-Bed Raised Air Mattress is at 74 x 39 x 18 inches. Both have an 18-inch raised height for added support and comfort. The Serta Raised Air Mattress is very similar to the Insta-Bed air mattress earlier featured on this list with a slight difference when it comes to price and color availability. This model comes in queen, queen pillow top bed, a blue queen-sized mattress and a twin-sized one. It also features two pumps in one mattress so if this is a feature you’re looking for, you know that you have another great option with the Serta Raised Air Mattress. Just the same with the Insta-Bed air mattress, the two pumps that are built in to the Serta Raised Air Mattress make it such a simple bed to set up. These automatic pumps let you do other things while inflating or deflating the mattress, which of course, saves you a lot of time and effort. The primary pump does so well in inflating and deflating the air mattress — it only needs less than four minutes. The secondary Never Flat pump still does inflating and re-inflating best because it automatically detects the air pressure and any loss of air according to your firmness preference will trigger the pump to inflate more air as needed. 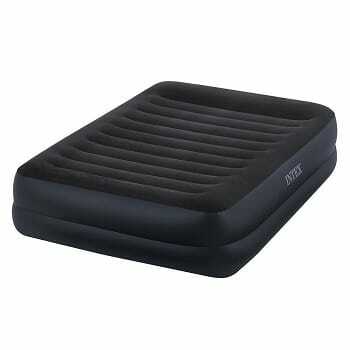 The Never Flat pump helps a lot when it comes to maintaining the durability of this air mattress. The same goes with its primary pump. Both air pumps built-in to the Serta Raised Air Mattress are automatic, which only means that it will never have too much or too little air pressure. In turn, the Serta Raised Air Mattress requires very little maintenance. Furthermore, it is made with puncture-resistant durable PVC material with a flocked top. This air mattress will surely hold up for many years of occasional to frequent use. As always, all air mattresses, no matter the brand, aren’t meant for permanent use but this Serta Raised Air Mattress is a very promising one and you surely won’t be disappointed. Aside from the Never Flat technology of the Serta Raised Air Mattress that adds a whole lot of comfort of continuous sleep through the night, there are other features as well that you will certainly appreciate. The circular coil system, which is an advanced support construction technology, gives a lot of support for the bed and keeps the sleeping surface on an even level. The queen-sized Serta Raised Air Mattress is built with 35 circular coils while the twin-sized bed comes with 21 circular coils. It also has a sure grip bottom, which keeps the mattress from moving. As earlier mentioned, the Serta Raised Air Mattress comes in several designs in queen and twin sizes. Its raised height is at 18 inches, which makes it a perfect mattress even without a bed frame. Without a doubt, Coleman is the leading brand when it comes to camping, hiking and other outdoor recreation needs. From water jugs to coolers, flashlights to camping tents, and so much more, Coleman is probably one of the most, if not the most popular manufacturer of these products. There’s no wonder why Coleman has ventured into manufacturing air mattresses as well. Certainly, the Coleman Premium Double High SupportRest Airbed did not disappoint as it doesn’t only look sturdy and stylish with three colors in a grid design, it delivers to the demands of any individual for an airbed. The best part, it very affordable — in fact, the most affordable so far compared to the first three air mattresses featured on this list. Perhaps it is with the expertise of Coleman in products made for outdoor use that one would expect that their air mattress is very easy to set-up. True enough, the Coleman Premium Double High SupportRest Airbed makes it very easy for you. For its price, you will appreciate that this air mattress already has a built-in air pump. It also features an airtight system with double lock valve so the mattress stays firm and inflated all night long. When deflated and ready for storage, you can keep your Coleman Premium Double High SupportRest Airbed in the zippered carry bag included in the package. 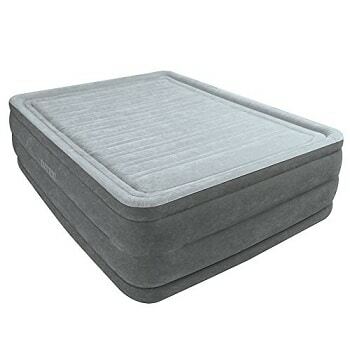 The Coleman Premium Double High SupportRest Airbed is built with very durable vinyl material and topped with soft suede fabric for added comfort. It was earlier mentioned that Coleman is one of the leaders in manufacturing outdoor products, but you must take note that the manufacturer themselves mentioned that this particular air mattress is made for indoor use. If you need an air mattress that you can use for camping, then you can easily select from other Coleman air mattresses available. Coleman kept comfort in mind when they built this air mattress. Its extra raised 18-inch height is meant for you to have more support and away from the floor. It also makes it easy for you to get on and off the bed even without a bed frame. You can adjust the firmness of the bed to find what’s most comfortable for you. If you feel that the bed is losing some air pressure, you can just inflate it a little bit more for added comfort. This is perfectly normal and common in all kinds of air mattresses. The Coleman Premium Double High SupportRest Airbed’s dimensions, when fully inflated, are 78 x 60 x 18 inches. As mentioned earlier, its extra height at 18 inches makes it all the more comfortable for you. 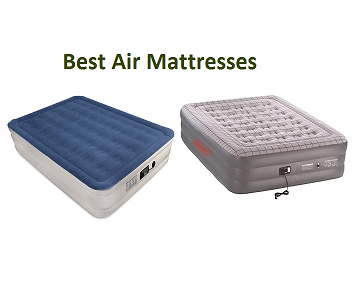 Even more affordable at just about half the price of the first few air mattresses on this list, the Coleman SupportRest Double High Airbed is definitely worth your attention. Again, this is coming from the Coleman brand and you can be guaranteed of reliability and durability that will last for years, of course, with proper care and maintenance. Unlike the Coleman Premium Double High SupportRest Airbed that was earlier featured, this airbed can be used both indoors and outdoors, which is perfect for camping enthusiasts. It comes in green too, which makes it blend perfectly with nature. The Coleman SupportRest Double High Airbed doesn’t have a built-in air pump so you will need to use a separate air pump to inflate it. Not having a built-in air pump isn’t all that bad. This only means that you can use your air mattress anywhere and everywhere — even when camping! The Coleman SupportRest Double High Airbed has an airtight system so there’s a no-leak guarantee. Furthermore, the double lock valve also helps make inflation and deflation quicker. After using your air mattress, you can enjoy convenience with the Wrap ’N’ Roll storage system. Coleman recommends a 120V Coleman air pump or a rechargeable air pump for the Coleman SupportRest Double High Airbed. If the Coleman brand isn’t enough to convince you that this air mattress is very durable, you have to know that the Coleman SupportRest Double High Airbed is made from heavy duty PVC. The queen-sized mattress can support up to 600 lbs. of weight. Since it is made for outdoor use, you are assured that this mattress is as durable as you expect it to be. It also has a soft plush top too. The velvet-like sleep that you can get out of the Coleman SupportRest Double High Airbed isn’t the only thing that makes it super comfortable. Its ComfortStrong coil construction gives you an even sleeping surface, even if you’re sharing the bed with someone else. Furthermore, it has a Support Lock reinforced construction for better support. With its AirTight technology, you will appreciate how the air stays inside the mattress throughout the night — and this technology is guaranteed to work as it was proven to be leak-free through factory tests and even comes with a warranty for added peace of mind. 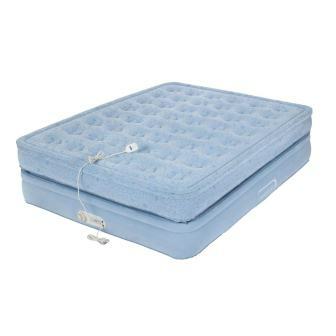 The Coleman SupportRest Double High Airbed is available in queen and twin sizes. Its 18-inch raised height adds a lot of convenience too. Standard bedsheets according to the mattress size will fit comfortably in this air mattress. When it comes to inflatables, Intex is a very respected brand. In fact, Intex airbeds are so popular; you’d see it practically everywhere — from campsites to dorm rooms to guest bedrooms and more. Even cheaper than the previous Coleman without an air pump, the Intex Dura-Beam Series Pillow Rest Raised Airbed comes with a pleasant surprise. For such an affordable price, this air mattress already comes with a built-in electric pump! As mentioned, the Intex Dura-Beam Series Pillow Rest Raised Airbed already comes with a built-in air pump. This queen-sized mattress is very easy to set up; you only need about 3.5 minutes, more or less, to fully inflate the mattress. The same air pump has a deflate function too for your convenience. When you’re ready to store it or transport your air mattress, you will certainly appreciate the duffel bag that comes with it. This 600-pound capacity air mattress has much to offer than just a simple and classic look and very fair price tag. The Intex Dura-Beam Series Pillow Rest Raised Airbed is, in fact, very durable. If Intex is an industry leader when it comes to inflatable swimming pools and pumps, then you can be rest assured that they will do what they do best for their air mattresses as well. This waterproof, flocked top air mattress features a Fiber-Tech beam construction design so that its structure remains stable for a long time. These inner beams are made up of thousands of very strong polyester fibers that you can expect to last for years of comfortable sleep. 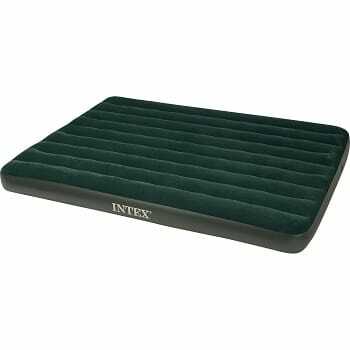 While most air mattress manufacturers will tell you that airbeds are supposed to be for temporary use only, Intex claims that the Intex Dura-Beam Series Pillow Rest Raised Airbed will actually hold up for extended use such as when you need a bed that you can use frequently in a dorm room or your own apartment. Speaking of comfort, the same Fiber-Tech beam construction of the Intex Dura-Beam Series Pillow Rest Raised Airbed makes you sleep soundly through the night with an even surface, even if you’re sharing the bed with someone else. These horizontal beams do not stretch over time and will definitely give you that much-needed rest and relaxation while on this mattress. You will also love how the Intex Dura-Beam Series Pillow Rest Raised Airbed comes with built-in pillows for added comfort. The Intex Dura-Beam Series Pillow Rest Raised Airbed is a queen-sized bed with dimensions of 60 x 80 x 16.5 inches when fully inflated. A standard queen bed sheet should fit it perfectly. Its raised height of 16.5 inches adds a lot of convenience too when getting on and off the bed. The first impression that the SimplySleeper SS-47T Ultra Tough Premium Twin Air Bed can give you is that it is oh, so pretty compared to other rugged-looking air beds. More than just its stylish look, this air mattress has so much more to offer. It is strong, durable and in fact, rugged too. Though it probably isn’t the first brand that comes to mind when looking for an air mattress, the SimplySleeper SS-47T Ultra Tough Premium Twin Air Bed proves to be much deserving of all the attention and the very satisfied reviews from hundreds of consumers because of all the features it offers. The setting up process is so easy with the SimplySleeper SS-47T Ultra Tough Premium Twin Air Bed. You will truly be simply sleeping in no time in a comfortable bed after inflating it with its built-in fully automatic air pump that gets the job done in just two minutes. You can even adjust the level of firmness with a quick switch according to what’s comfortable for you. The same air pump can be used to deflate the air mattress when you’re done using it. No wonder it’s a popular choice among those who are looking for an indoor or outdoor air mattress. Durability is what makes the SimplySleeper SS-47T Ultra Tough Premium Twin Air Bed. Don’t get this dainty looking air mattress wrong. With its name alone “Ultra Tough”, you’d know instantly that it truly is a tough air mattress. It is made with the highest quality materials and very durable durmothane polyester laminate (100% 150D polyester 0.48mm). It can support up to 400 pounds of weight with its X coil construction. On top of that, you get a unique three-layer puncture and stretch resistant air mattress that is very lightweight at only 10 pounds. Though its body is made with airtight materials, you still get two free repair patches should accidents happen. Of course, comfort wasn’t taken for granted when the manufacturers created the SimplySleeper SS-47T Ultra Tough Premium Twin Air Bed. Its X coil construction does very well in providing support and though it is only 8.5 inches in height, it feels like you’re sleeping on a very stable and comfortable mattress. Truly, the SimplySleeper SS-47T Ultra Tough Premium Twin Air Bed is all you need for a good night’s sleep. This twin-sized air mattress measures 75.5 x 40 x 8.5 inches when fully inflated. The SimplySleeper SS-47T Ultra Tough Premium Twin Air Bed, as mentioned, may not have an extra raised height compared to other air mattresses previously listed here but it’s still worth the try. Another Intex makes it to this list of the best air mattresses in the market today and it sure is well deserving of a spot on the top 10. The Intex Queen Prestige Downy Airbed is perfect for your camping needs and even for indoor use because it offers exactly what you need from an air mattress and more. This queen-sized air mattress is so affordable; you’ll appreciate how it’s only a quarter of the price of most of some of the mattresses on this list. Don’t let the price fool you though. Its quality is topnotch and you’ll definitely get more than what you’re paying for with the Intex Queen Prestige Downy Airbed. The Intex Queen Prestige Downy Airbed doesn’t have a built-in air pump; however, you will surely appreciate how it comes with a hand held battery pump. 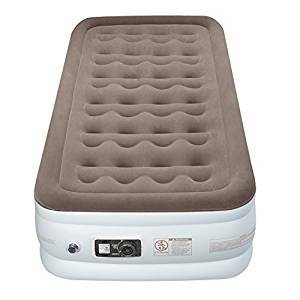 This makes the Intex Queen Prestige Downy Airbed the perfect air mattress to take with you during your camping trips because you don’t have to manually pump air into it and you don’t have to look for a power outlet anymore. The air pump is powered by 6 C-sized batteries (not included in the package), which you can easily find in most convenience stores. The same hand held air pump can even be used for other inflatables too. The Intex Queen Prestige Downy Airbed comes with a 3-in-1 valve. The valve’s extra-wide opening allows quick and easy inflating and deflating. When not in use, the Intex Queen Prestige Downy Airbed can be folded for easy storage. 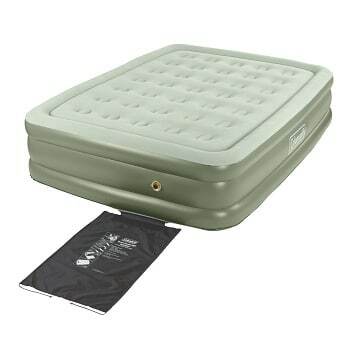 Very classy with its green color that will look absolutely great in your campsite or your guest bedroom, you can cover this air mattress with your standard queen-sized bed sheet. The Intex Queen Prestige Downy Airbed is made with very durable vinyl so you can be guaranteed that you can use it for an extended period of time without any problems. This air mattress is so strong, it can withstand up to 600 pounds of weight. Its top is constructed with a 20.8-gauge waterproof top. For added stability and comfort, it comes with 14-gauge vinyl beams and 15-gauge sides. For a very comfortable feel, the Intex Queen Prestige Downy Airbed is topped with a soft flock fabric that gives you such a luxurious sleeping surface, as what the manufacturer would call it. The air mattress remains firm throughout the night though you may need to top it off with air if you plan on using it for more than just a couple of nights. There are 14-gauge vinyl beams and 15-gauge sides do a lot with the comfort and support this mattress can give you despite its 8.75-inch raised height. If you’re looking for a raised mattress, then this probably won’t be an option for you. However, the Intex Queen Prestige Downy Airbed is great if you don’t mind sleeping on a comfortable mattress close to the floor, whether indoors or outdoors, or if you have a bed frame that you can use. The Intex Queen Prestige Downy Airbed has an 8.75-inch raised height with dimensions of 60 x 80 x 9.75 inches when fully inflated. Another air mattress from Intex that continues to be a best seller among very happy shoppers, the Intex Comfort Plush Elevated Dura-Beam Airbed is most probably one of the most affordable raised air mattresses of its kind in the market today. Similar air mattresses earlier featured on this list are at least double the price of this Intex and when it comes to features and durability, this air mattress surely isn’t far behind. Thousands of customers generously left their very satisfied comments and can attest that this air mattress is truly worth every dollar you pay for it. The Intex Comfort Plush Elevated Dura-Beam Airbed comes with a high-powered built-in electric pump. You can inflate and deflate the air mattress without any hassle. Inflation time takes only about 4.5 minutes and you can adjust according to the firmness you desire. Unlike other air mattresses with built-in air pumps though, the Intex Comfort Plush Elevated Dura-Beam Airbed can be bused for camping or when traveling because you can replace the air pump and use a separate pump instead. This feature comes useful when there’s no power outlet in sight and you opt to use a rechargeable or manual air pump. When you’re done using the mattress, just deflate, fold and store in the included duffel bag, which makes transporting this air mattress so easy. There are Intex air mattresses that are at least double the price of the Intex Comfort Plush Elevated Dura-Beam Airbed such as their Plus Series but this particular model is very competitive especially when it comes to durability. Why spend more when you can have an equally durable and comfortable bed for less, right? The Intex Comfort Plush Elevated Dura-Beam Airbed though is made for indoor use and not for your camping needs. Though as mentioned, you can use a separate air pump if you wish to take it some place else. After all, it is made with quality-tested materials including 20.8-gauge waterproof-flocked top and 16-gauge sides and bottom for added durability. This mattress can accommodate up to 600 pounds of weight. The main material used in making this air mattress is vinyl, which stretches then relaxes over time. You may need to top off the mattress with air when used for more than two night straight. This air mattress is so stable. You’ll see it and you’ll feel it. It has a very impressive raised height of 22 inches so it feels like you are on a traditional bed with a frame — no need to struggle in getting on and off the bed. Just the same with another Intex air mattress earlier covered, the Intex Comfort Plush Elevated Dura-Beam Airbed boasts of its Fiber-Tech beam construction, which makes this mattress very comfortable and stable. You will surely have a great time relaxing and catching your much needed rest on this air mattress. The queen-sized Intex Comfort Plush Elevated Dura-Beam Airbed, as mentioned, has an impressive raised height of 22 inches. Its full dimensions when inflated are 60 x 80 x 22 inches. To end this list, the much deserving Coleman QuickBed Elite Extra High Airbed grabs the tenth spot. It is very affordable, first and foremost, so you probably won’t have to think twice when choosing this air mattress as a substitute for your best latex mattresses. However, don’t get confused with the “Extra High” description on its name because this is not an air mattress with extra raised height. It is only at 9.5 inches, which is already enough to give you much stability and support while lying down. This air mattress is made for indoor and outdoor use and is available in twin and queen sizes. 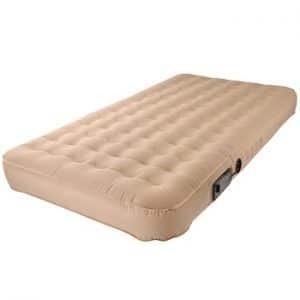 This very attractive looking air mattress is once again very easy to set up. Its price is well worth it because it already comes with a built-in 4D pump. It is a battery-operated pump (batteries are not included in the package), so it means you can easily set up this bed not only inside your home but also in the campsite or as you travel. A carry bag is already included in the package. 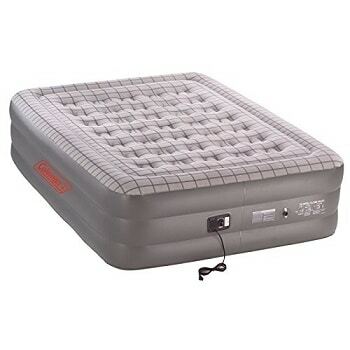 The Coleman QuickBed Elite Extra High Airbed is a very sturdy and durable air mattress. It features an AirTight System so there won’t be any air leaks while you’re sleeping through the night. This is made even better with its Double Lock valve. This is a very tough air mattress that you can expect to last through years of occasional use. As most air mattresses, this isn’t designed for daily use for months or years at a time, though with proper maintenance, the Coleman QuickBed Elite Extra High Airbed will surely hold up. Just top it with air every so often to ensure that the mattress stays in shape and remains at the right firmness. In addition, the Coleman QuickBed Elite Extra High Airbed can support up to 600 pounds of weight. Comfort is the best feature offered by the Coleman QuickBed Elite Extra High Airbed. Not only is it an attractive bed, it has proven that a raised height is not a requirement to give enough support to an air mattress. However, it is good to note that the 9.5-inch raised height of this air mattress is already higher than othersmaller air mattresses that can give you less than 9 inches raised height. The ComfortStrong coil system, which features 48 internal coils, is responsible for the comfort that this mattress can offer. Furthermore, this air mattress has a soft plush top, which gives much comfort while sleeping. Of course, it is still recommended to use a sheet on top of the bed. The Coleman QuickBed Elite Extra High Airbed is available in queen and twin sizes. Again, its raised height is at 9.5 inches and its measurements when fully inflated are at 78 x 58 x 9.5 inches. The QUEEN SIZE Luxury Raised Air Mattress from King Koil, Elevated Raised Air Mattress Quilt Top. Best Inflatable Airbed with Built-in Pump & 1-year GUARANTEE makes the user feel comfortable like never before. This mattress acts as an aspirational air bed and boasts the finest of the elements that are used in making air mattresses. 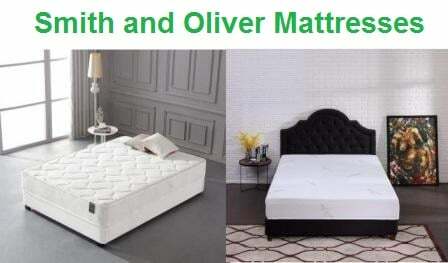 The materials used in this mattress have been tested over time and they have proven their worth. The consumers who purchase this air mattress are thus able to enjoy a memorable and premier quality sleep experience of their lifetime. This air mattress is manufactured using the latest possible technology which enables the mattress to have a built-in pump as well as a coil-beam type of construction. The QUEEN SIZE Luxury Raised Air Mattress from King Koil, Elevated Raised Air Mattress Quilt Top. Best Inflatable Airbed with Built-in Pump & 1-year GUARANTEE comes with an internal air pump which allows for very fast and easy inflation of the air mattress. It is extremely easy to use and allows for easy deflation as well. The air pump is so powerful that it takes under 3 minutes for the whole air mattress to reach the maximum desired inflation. This air bed or mattress has been designed by the manufacturer for use at home or when guests or relatives arrive and a spare bed is required. It serves the purpose of an outdoor bed whenever the user goes on a camping trip or for any outdoor activity that requires sleeping in the outdoors over the night. The manufacturer stands behind the quality of this air mattress and provides a 1-year guarantee. The coil beam construction makes the air mattress durable and enables it to last for a long time. The durability of the air mattress, as well as its quality, are proven by the confidence the manufacturer has in assuring this guarantee. The Comfort level offered by this air mattress is one of its kind as it supports the spine of the user and enables excellent sleeping postures. The level of comfort is facilitated by the fact that King Koil makes extremely beautiful and comfortable air mattresses as well as other beds and these are in fact featured in many hotels around the world. King Koil air mattress enables the perfect sleeping posture taking comfort to the next level. 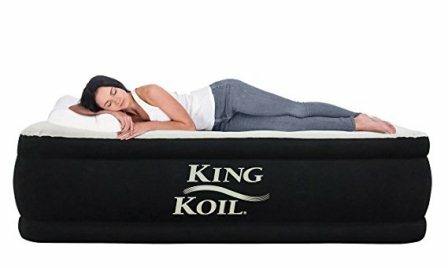 That is why the King Koil manufacturing has been endorsed by the International Chiropractors Association for the purpose of supporting proper alignment of the spine as the user sleeps on the air mattress. This gives the user a very healthy and comfortable whole night’s sleep. This air mattress from King Coil is available in Twin, Queen and California King sizes. The inflated size of the Queen size mattress is 80 X 60 X 20 inches. the air mattress is made available to the purchaser along with a Carrying Bag. The Upgraded Air Mattress Raised Guest, Blow Up, Durable Firm Bed Inflatable Airbed from Easy Setup, Etekcity with Built-in Electric Pump, Height 18″/22″, Twin/Queen Size, with Storage Bag has been manufactured with superior welding procedures that allow the air mattress to be as airtight as possible and there is no moving noise emanating from this air mattress. The design is unique in the sense that it prevents the edges from falling down and the user is able to enjoy deeply restful good night’s sleep for the whole night and wake up rejuvenated in the morning to face the hectic day ahead. The set up for the Upgraded Air Mattress Raised Guest, Blow Up, Durable Firm Bed Inflatable Airbed from Easy Setup, Etekcity with Built-in Electric Pump, Height 18″/22″, Twin/Queen Size, with Storage Bag is extremely quick and it is also very convenient for the user. There is a built-in Air pump which is able to rapidly inflate or deflate the air mattress to the desired level of firmness in between 3 to 5 minutes depending on the firmness level. The AC Pump’s power cord can always be easily stashed away in a compartment built for this purpose and therefore, it would not need to be put away somewhere else in the room. This ensures that the room stays clutter-free. The air mattress control dial needs to be back at the ‘Off” position once the desired firmness has been reached. The materials used in making this Upgraded Air Mattress Raised Guest, Blow Up, Durable Firm Bed Inflatable Airbed from Easy Setup, Etekcity with Built-in Electric Pump, Height 18″/22″, Twin/Queen Size, with Storage Bag is of very high quality. The material used is puncture resistant and is used in double layers. This ensures that the air mattress always retains its correct form. The flocked tops are waterproof and therefore are always dry and allow the user to have a very soft and comfortable sleep throughout the night enabling him/her to wake up extremely fresh in the morning while at the same time ensure durability for the air mattress. The 0.4mm extra thick eco-friendly PVC underside makes the air mattress strong and also prevents any unwanted sliding. The skid-free base of this Upgraded Air Mattress Raised Guest, Blow Up, Durable Firm Bed Inflatable Airbed from Easy Setup, Etekcity with Built-in Electric Pump, Height 18″/22″, Twin/Queen Size, with Storage Bag keeps the air bed from moving around as the user tosses and turns in trying to get to the correct and the most comfortable position. The inner construction of the air bed is such that the comfort and stability thus obtained are like a real bed. this air mattress has a capacity of 550 lbs. All the parts of the user’s body are fully supported by the unique wave veins and this enables the user to get rid of the fatigue due to a hard day’s work. Size18 inches, and the Queen size 22 inches. This air mattress is available in the 2-Pack Twin size 18 inches, Twin Size 18 inches and the Queen size 22 inches. The indented sides are for allowing regular pocket sheets of up to 18 inches in depth so that they can be put on really snuggly. 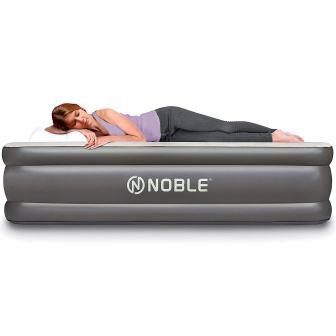 The QUEEN SIZE Comfort DOUBLE HIGH Raised Air Mattress from Noble, Elevated Raised Air Mattress Quilt Top, Top Inflatable Airbed with Built-in Pump and & 1-year GUARANTEE is an epitome of both luxury and comfort. It boasts the finest of the components available for air mattresses and employs the highest quality materials in the making. The sleep experience offered by this air mattress is in a class of its own. This air bed along with other Noble air beds are recognized all over the world and spell quality. The user is able to attain the best possible posture for sleeping as well as perfect support for the spine on this air mattress and this enables a very sound, comfortable, undisturbed sleep throughout the night. A deep night rest is essential to a perfectly energetic state of the user the next day and this air mattress has been designed to offer exactly this to the user. It is extremely easy and convenient for the user to set up the QUEEN SIZE Comfort DOUBLE HIGH Raised Air Mattress from Noble, Elevated Raised Air Mattress Quilt Top, Top Inflatable Airbed with Built-in Pump and & 1-year GUARANTEE upon arrival at home after purchase. The built-in AC pump needs to be connected to the AC mains and the air mattress would inflate to 80″ x 58″ x 18″ within a few minutes. This is the size after the maximum amount of inflation. This air mattress is very durable thanks to the finest elements of an air mattress utilized in its coil beam construction, Noble beam technology is famous all over the world and is trusted by the users for both comforts as well as durability. The company offers a 1-year guarantee based on the confidence it has on the quality and durability of its air mattresses. Its durability is maintained whether it is used outside on camping trips or used at home for visiting relatives and friends. The QUEEN SIZE Comfort DOUBLE HIGH Raised Air Mattress from Noble, Elevated Raised Air Mattress Quilt Top, Top Inflatable Airbed with Built-in Pump and & 1-year GUARANTEE is manufactured using the unique NOBLE Coil beam technology which allows the user of this air mattress to get the feeling of sleeping on a cloud as the flocking layer adds tremendously to the comfort. The air beam construction, as well as the built-in air pump running on AC 120 V, enables maximum possible inflation and comfort. The waterproof nature of the comfort quilt top ads extra support to the user’s body while the firm mattress enables a proper sleeping posture. The bedding and sheets stay in place due to the sueded top. This air mattress is only available in Queen size. Once inflated, its dimensions are 80″ x 58″ x 18″. The air mattress weighs 25.2 lbs. The air mattress is delivered to the user along with a Carrying Bag which enables easy carriage and transportation. The KING size – Best Choice RAISED Inflatable Bed from Air Mattress (Airmattress.com) with Bed Skirt and Fitted Sheet, Built-in High Capacity Airbed Pump carries a completely risk-free 60-day trial as well as a one-year warranty. This is reflective of the high quality of this air mattress. This air mattress is firm enough not to stretch or collapse like many other air beds in the market that do just that. Such collapsible and stretchable air beds are unable to support the user’s spine and the joints in the proper manner. This air mattress carries a laminated surface which is ideal for supporting the user’s spine and at the same time offers robust edges to keep the mattress strong and durable while contributing to a very comfortable sleep for the user. It is extremely Pump quick and convenient to set up this KING size – Best Choice RAISED Inflatable Bed from Air Mattress (Airmattress.com) with Bed Skirt and Fitted Sheet, Built-in High Capacity Airbed at home or anywhere else by simply letting the Air Pump connected to the AC mains and letting g the air mattress be inflated to the desired level of firmness. The full inflation is attained in just a few minutes and the air mattress is ready to be used at the desired location. The air mattress maintains its firmness due to the air-tight nature of the air bed. The KING size – Best Choice RAISED Inflatable Bed from Air Mattress (Airmattress.com) with Bed Skirt and Fitted Sheet, Built-in High Capacity Airbed is highly durable due to the high-quality materials used in the construction of this air mattress. This durability is further enhanced by the addition of a laminated layer to the mattress which keeps the mattress protected and at the same time enhances its durability. This air mattress is available for the users in Twin XL, Full, King and Queen sizes. The Queen size of this air mattress inflates to 80 x 74 x 18 inches and weight of this product is 25.6 lbs. It can fit into sheets with 18 inches pockets. 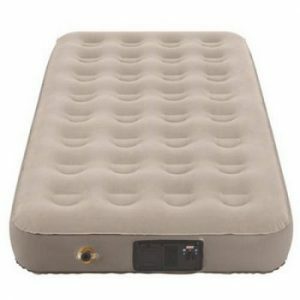 The Aerobed Premium Mattress-Style Queen Air Bed from Coleman with Built-in Air Pump lets the user offer a unique experience to his/her guests as they wake up completely refreshed and rejuvenated after sleeping overnight on this spectacular air bed. The bed has an antimicrobial treated sleep surface which is resistant to such irritants as molds, odor, fungus, and mildew, etc. and this helps to keep the user protected from allergies and any other type of skin irritation. Therefore, this air bed is highly suitable for people who have allergy related issues and who normally wake up with stuffy noses or teary eyes. It would enable them to have a fully comfortable and deep sleep throughout the night and they would wake up energized and totally refreshed the next day. The setting up of the Aerobed Premium Mattress-Style Queen Air Bed from Coleman with Built-in Air Pump simply involves laying the air mattress at the desired location either indoors or outdoors and connecting the Built-in AC Air Pump to the AC mains and letting the Air Pump to inflate the air mattress to the desired level of firmness in a few minutes. The deflation can also be achieved quite conveniently in a similar manner. When the user needs to pack up the mattress, all that is required to do is to open up the Whoosh valve completely and let the mattress deflate all the way. The Carrying Bag is oversized and it can easily carry the air mattress to any place desired. The carriage and transportation of this mattress are facilitated by using this Carrying Bag. The durability of the Aerobed Premium Mattress-Style Queen Air Bed from Coleman with Built-in Air Pump is related to the high-quality materials used in the construction of this air mattress. Its vinyl 4-layer construction ensures a high level of support to the user beside making the air bed durable. The Air Pump in the mattress is also of very high quality and helps the users to inflate and deflate the airbed whenever required. The Carrying bag ensures that the air bed is safe when stored and adds to the durability of this air mattress. The Aerobed Premium Mattress-Style Queen Air Bed from Coleman with Built-in Air Pump provides a high level of comfort to the user due to its ability to repel allergens and other irritants. This is especially true for people who have allergy related issues. The firmness of this air mattress can be regulated using the air pump so that the desired level of firmness of the mattress as preferred by the user is attained to maximize the comfort level of the user. The firmness adjusts button on the air Pump can always be adjusted to get just the right level of firmness as per the comfort level of the individual who would sleep on the air mattress. The comfort level is further enhanced by the support provided by the 4-layer construction of this air mattress which makes the user feel as if he/she is sleeping on a traditional bed. The size of this air mattress is 21 x 16 x 10 inches and it weighs 34 pounds. It is only available in Queen size and is not available in any other sizes.